«Newton created white from all colours. He’s even fooled you, so that you will believe in secular world!» — with that, the great German poet Goethe came into conflict with Newton more than a hundred years after the British physicist had detailed a new order of colours. Newton had transformed the normal linear system into a circle, dispensing with the old organisation according to values of brightness and darkness. Using modern lettering and his original script, we can see that Newton’s colour circle comprises seven colours in the sequence red (p) — orange (q) — yellow (r) — green (s) — cyan (t) — ultramarine (v) — violet (x). Black and white have been excluded, and the vacant centre of the circle has instead been expressly assigned to white in order to symbolise that the sum of all the specified colours will result in white light. Goethe protested vehemently against this idea, and therefore attacked the foundation of Newtonian optics, the basis of which is the separation of daylight by a prism. Isaac Newton (1642-1726) can certainly be counted amongst history’s most influential scientists, and his most productive period was during his youth. He had begun to develop his «method of fluxions» — nowadays known as infinitesimal calculus and making possible the mathematical treatment of speeds and accelerations — when he was just twenty two years old. Four years later, he constructed a reflecting telescope (to eliminate the irritating aberrations of its predecessors). It was also during these years that he gained the insights for which he was to become famous — Newton was able to demonstrate that an apple falling to the ground and the moon orbiting the earth both obey the same mechanical laws. In other words, he showed that the physics of the earth is likewise the physics of the heavens. The cosmos is not strange to us; our laws apply there, too. In 1687, Newton published his greatest work, «Philosophiae Naturalis Principia Mathematica», in which he propounded his ideas on gravitation and its mathematical treatment. By this time, he had also undertaken optical experiments, and had long understood that white light was made up of coloured rays. He submitted a work to the Royal Society in 1672, in which he presented «a new theory of light and colours». The plague had threatened London in the previous year, so Newton withdrew for several months to his parents’ farm in the County of Lincolnshire. Here, he began by repeating Marci’s experiments. In 1648, Marci had directed white light through a prism and observed its deflections. Newton took this a step further, becoming convinced that the deflected light rays ran on in a straight line after passing through the prism. In his «experimentum crucis», Newton directed the rays which had been refracted by a first prism through a second prism. He observed that they were deflected once more, but were otherwise not altered (further separated into colours). For Newton, this was proof that colours are not modifications of white light, but are the original components of white light. White light is composed of coloured light: in fact (according to Newton), the seven colours which are located within the colour-circle. This coloured light is not a mixture. It is a single colour, and is pure. It can be mixed, of course, to produce secondary colours, but if the components combine in the correct proportions, the light will appear white. The palette formed through the refraction of light by a prism is referred to as the colour spectrum, the components of which are the spectral colours. The question now is, how do we explain them? For what reason is blue light deflected (refracted) in a prism to a greater degree than red light? An answer could only be provided if more was known about the nature of light. What actually was a light ray, which evidently moved in a straight line? Did it involve a wave, as could be seen running along a rope? Or did light comprise tiny particles (corpuscles)? Newton attempted to clarify these questions in his second definitive work, his Opticks, which first appeared in 1704 and contained the colour-circle which we reproduce. The colours are marked here by circular figures, at their largest for red and becoming progressively smaller towards violet. In this way, Newton reveals something of his ideas about the nature of light. He believed that light was composed of corpuscles which were deflected by a prism according to their size: the large red was subjected to the least deflection, and the small blue the most. Let us now examine other details in Newton’s colour circle. Its colours are allocated to segments, the sizes of which are proportional to their respective colour’s intensity in the spectrum. Using this segment size, and the varying sizes of the light corpuscles, it was possible to calculate a type of concentration point for the circle — marked as Z by Newton — and mark it in. The straight line, which connected the white colour centre O and this centre of concentration Z, intercepted the circle at Y. 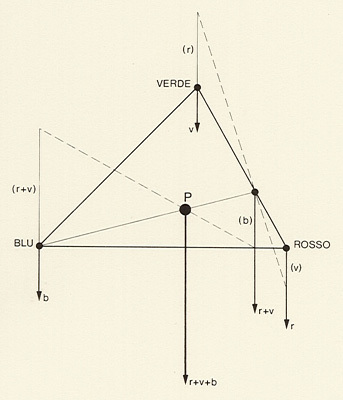 Bearing in mind Newton’s love of mechanics, colour mixtures can then be represented by drawing a triangle of forces (below right), the three corners of which are formed by the three basic colours: rosso (red), blu (blue) and verde (green). Newton’s view that the nature of light was composed of corpuscles contradicted that of the Dutchman Christian Huygens, who published his paper «Traité de la Lumière» in 1678. Huygens saw light as movement within a fine medium, with its motion being triggered by shocks within matter which in turn emanated light. A forerunner of this wave idea, by the way, dates back 400 years to Robert Grosseteste, who had envisaged light spreading as a «species» («multiplicatio speciorum»). Unfortunately, in his idea, Huygens completely neglected the problem of how the spectral colours could be formed. The now accepted answer, pointing to an increase in wavelength from blue to red, remained illusive to him. It was only in the 19th century, through the diffraction of light through a grating, that measurements could be made with regard to the order of magnitude of the wavelengths involved here. Newton’s colour circle will remain inadequately explained if we ignore its inventor’s belief that the propagation of both light and sound are comparable, and that they should therefore be treated harmonically in an identical way. 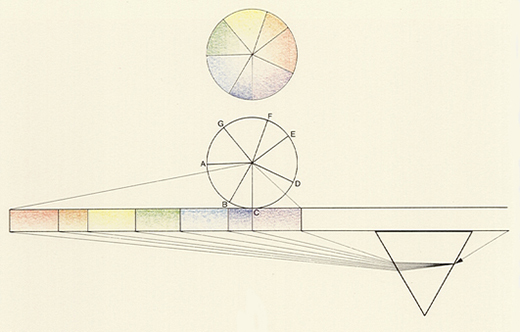 Newton selected his seven colours because an octave displays seven sound intervals. He allocated segments to them in accordance to their value in the Dorian musical scale. The individual sound tones associated with this scale coincide with the borders between the colour grades: D, for example, with the border between violet and red; A with the border between green and blue. This mathematical-musical appropriation of colours makes it difficult for many to understand Newton’s system which, with its seven (instead of five) primary colours, has more of an aesthetic basis than a scientific one. With Newton’s colour circle, the transition between the one- and two- dimensional colour system is complete. It is helpful to realise that although this step was made by a physicist, it actually has little to do with physics. The spectrum which Newton sees on the other side of his prism is a line which he can only transform into a circle because the colour tones merge into one another gradually. For this reason alone, and by dispensing with purple, the short-wave end (violet) can be joined onto the long-wave end (red). This omission in physics is overcome by our senses: out of the straight line of physics, it is actually the human brain which creates this circle, first drawn by Newton. We understand colours only when we also take into account those who see them. 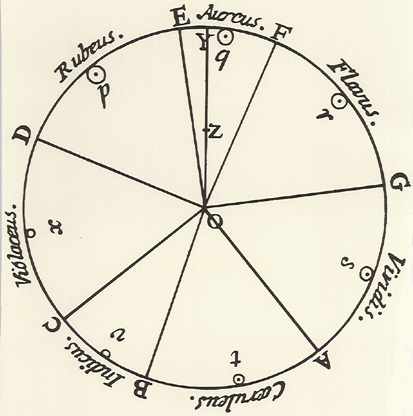 Date: The famous circular arrangement of spectral colours appeared in 1704 in his central work: Opticks. Bibliography: Newton, «Opticks», London 1704 (numerous subsequent editions); K. T. A. Halbertsma, «A History of the Theory of Colour», Amsterdam 1949; R. S. Westfall, «The development of Newton’s theory of color», Isis 53, pp 339-358 (1962); John Gage, «Colour and Culture, Practice and Meaning from Antiquity to Abstraction», Thames and Hudson, 1993, pp. 201-203 (mention and comment).